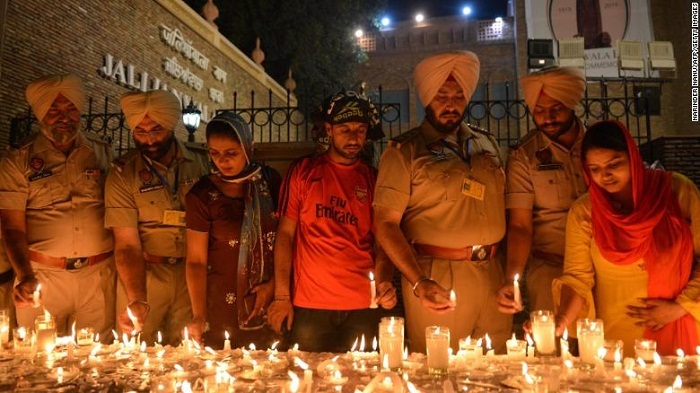 Hundreds have gathered in the northern Indian city of Amritsar to mark the centenary of the Jallianwala Bagh massacre where British troops killed hundreds of men, women and children. On April 13, 1919, British troops fired without warning on a peaceful protest of thousands of unarmed Indians in Amritsar, Punjab, in what became alternately known as the Amritsar or the Jallianwala Bagh massacre. While the number of those killed is disputed between British and Indian authorities, a report by a British-led committee following the massacre put the number of victims at close to 400, with three to four times as many people injured. Indian observers said more than 1,000 people lost their lives. Rahul Gandhi, the president of the India National Congress, the main opposition party, was joined at the site of the massacre by Punjab State Chief, Captain Amarinder Singh, to lay a floral wreath to victims. Indian Prime Minister Narendra Modi also paid homage to those killed at Amritsar during a rally in the southern Indian state of Tamil Nadu. "Their valour and sacrifice will never be forgotten. Their memory inspires us to work even harder to build an India they would be proud of," Modi later tweeted. Indian school students hold the national flag in honor of the Jallianwala Bagh massacre, on the eve of the anniversary. UK Prime Minister Theresa May mentioned the massacre during Prime Minister's Questions on Wednesday, describing it as "a shameful scar on British-Indian history." She added, "As Her Majesty the Queen said before visiting Jallianwala Bagh in 1997, 'It is a distressing example of our past history with India. We deeply regret what happened and the suffering caused.'" However, Harsimrat Kaur Badal, a minister in Modi's government, dismissed May's statement and demanded a full apology from the UK government. "British Prime Minister Theresa May calling the #JallianwalaBaghMassacre a "shameful act" in British-Indian history is not good enough. There should be an apology in clear words," she tweeted. British High Commissioner to India, Dominic Asquith, visited a memorial in Amritsar on Saturday and told reporters, "You might want to re-write history, as the Queen said, but you can't." According to Reuters, Asquith added: "The revulsion that we felt at the time is still strong today. It tarnished the reputation and we regret, as I say, the suffering and will continue to do so."